VIEW! NAVIO claims an enviable location on the seawall in vibrant Southeast False Creek overlooking a 2.7 acre park. Celebrate outdoor living all year round with 149 SF balcony overlooking dramatic views of the ocean, mountains and city skyline. Open kitchen blends seamlessly with the living spaces and features elegant wood veneer and contemporary high-gloss cabinetry, sophisticated granite slab kitchen island with waterfall gables and full height pantry. Bathrooms include large format porcelain tiles, floating wood veneer vanity, frameless glass shower door and infloor heating. Features top of the line Bosch appliances, 8'8 ceilings, A/C, 2 parking stalls & generous insuite storage room. Developed by award winning Concert.GST included! . Rarely available, North-facing luxurious Penthouse offers 180 degree unobstructed views through 10'2 floor to ceiling windows. Enjoy stunning mountain, water and city views with complete privacy from every room. Completely renovated in December 2018, the new kitchen and bathrooms feature brand new cabinets, BOSCH appliances, Caesarstone quartz and Brizo Lux Gold faucets. Modern eng. H/W flooring throughout. Spacious open floor plan allows for entertaining in the living and dining areas; bedrooms are separated with custom closets. Upstairs features a bright flex space that leads to a 1100+ sqft. private rooftop deck. Great amenities include: modern gym, sauna, party room, theatre & 24-hr concierge. . STUNNING, LUXURIOUS. LEED GOLD CERTIFICATION. NAVIO claims an enviable location on the seawall in one of Vancouver's most desirable neighborhoods. Vibrant community with its own gourmet grocery store & an eclectic array of specialty shops, cafes, restaurants & entertainment. Overlooks a beautiful 2.7 acre park. Modern, high end finish & appliances throughout. Spacious floorplan with 8'8 to 10' high ceilings. Year round comfort with NUheat infloor heating & A/C climate control in suite. Huge balcony accessible through double floor to ceiling sliding doors with unobstructed view of Science World, Downtown, and Northshore mountains. Fully equipped fitness room, beautiful rooftop terraces & private residents lounge. . Welcome to "Pilkington House", Largest NY Style Concrete & Brick loft in Vancouver nested in a boutique true VIP 7-unit building with only 2 units per floor.Constructed in 1910 as a Glass company & converted to lofts/offices in the early 1990's by Rositch Hemphill Architects (RHA).The Loft features 2 separate entrances,2 open plan living rooms,3 bdrms,2 full bath, 9.5" high ceilings, lots of lights from N/W/S windows,plenty of storage & access to a manicured common rooftop patio & garden.Stone gas fireplace, polished concrete flooring & exposed brick walls. Lrg Modernized Chefs kitchen, stone surface, soft-close cabinetry, 2 wall-mounted ovens, wine fridge, built-in coffee machine! Property also Listed on MLS for SALE as COMMERCIAL/OFFICE â€“ MLS#C8023208 . ADVANCED PRE-SALE ON APRIL 27th 28th at 4445 West 10th Ave. Over 310 sf of balcony with open City views. 6 story boutique building with Downtown views. GRAND is a fully CONCRETE building featuring Delivery hub. bi-folding balcony doors to add the balcony to the living area. a fully equipped gym with a 24/7 virtual trainer, smart home packages. A/C units, Italian Kitchen cabinets and vanities and a lot more. The projected completion is July 2020. Further incentives available for the first 7 Buyers. Steps away from future Main and Broadway Skytrain station. Non-repeatable location. Sales centre at 4445 West 10th Ave. South facing unobstructed views. . Brand new 3 BD 2 BTH +Flx Penthouse of One Town Centre centrally located in the emerging neighbourhood of River District. It's the tallest building in this neighbourhood so come and live on the top of it all! South-East facing corner unit with over-height ceilings, and 1900 sqft of outdoor space overlooking the panoramic view of the Water and Vancouver, Burnaby and New West. Interiors include SS appliances by Jenn-Air with 5 burner gas cooktop, fridge, quartz countertops, auto blinds and air conditioning. Enjoy 14,000 + sq ft high end amenities with indoor pool, hot tub, sauna/steam room, gym, squash court, dance/yoga studio, party and guest rooms. Everything you need is steps away: Save-On-Food, restaurants, Liquor store Starbucks and banks - a lifestyle you don't want to miss! . We are proud to offer this amazing property in the highly sought after 'The National' on Vancouver's False Creek. The owners have completely renovated this wonderful home to the highest standard. Offering three bedrooms, two bathrooms, two parking stalls & a storage locker, this home feels much larger than 1500 square feet. Enjoy the many amenities The National offers, or just step out your door to Vancouver's Seawall, you will be a short walk to Olympic Village & Granville Island. Schedule your own private viewing today! . 35 Gore Avenue is situated in the Edge Development, which is strategically and conveniently located at the 3-way intersection of Gore Avenue, Alexander Street and Railway Street. The Edge is a large scale mixed-use development that features creative and inspirational spaces for living and working. The subject property is a unique live-work strata unit featuring double height ceilings, a funky concrete finish, a generous storefront entrance way, with large glass window panels, grade level loading at the rear with a roll-up loading door, 2 parking stalls, a nicely improved washroom and shower, kitchen and much much more. . Roof Top Patio Alert! This fully renovated, 2 bed & nook home is a must see with over 1,200 sqft of space + your own personal 800 sqft private rooftop patio with endless views of False Creek and Downtown! Homes like this are rare. Newly renovated from head to toe this is an untouched home including hardwood flooring, full size stainless steel appliances, stone counters and much more. Extra features include two side-by-side parking stalls, storage, gas hook up on roof-top and both bedrooms comes with a walk-in closet. Enjoy the massive living space great for entertaining surrounded with windows & vibrant views. Become part of the every growing community of Mount Pleasant / Main Street. Pets (2) and rentals allowed. Text for info! . Pinnacle on the Park - Estimated Completion Fall of 2019. This north west facing 3 bedroom plus den brings views of False Creek park, city and mountain views. Unit features high end appliances and heat pump air conditioning. Steps away from Olympic Village's well known eateries and pubs. Shopping, transit and the 2nd Avenue Tech Hub is all walking distance from this new development. Unit comes with 1 parking and a bicycle storage area. Call our Sales Centre of more information! . A bold statement of ultra luxury & sleek interior design by renowned Bijou Projects. Expansive 2 bed/2 bath WATER facing residence, perfect blend of rich woods, deep marble finishings & warm, inviting palette that will have you loving your home. A one of a kind open concept kitchen w/gorgeous Italian marble backsplash & Fisher Paykel appliance pkg. The master bedroom is a true retreat, wake up to water views, walk through superstar custom closets w/added lighting. Bathrooms are 5 star luxury w/7 inch thick carrera marble countertop. Attention to detail & quality of finish is outstanding. Nothing to do but move in & enjoy an urban retreat. 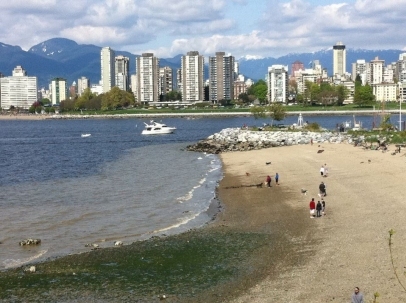 New park below, seawall, walk to Olympic Village & Yaletown. Two parking & locker. Open House Saturday, April 27th 2-4PM. . Welcome to the epitome of urban living at The Edge. This exceptionally rare penthouse loft is bound to impress with polished concrete floors, 16â€™ ceilings and floor-to-ceiling windows. Chefâ€™s kitchen with quartz counters, Wolf gas range, Fisher Paykel fridge, integrated dishwasher and plenty of custom built-ins. Spacious living area with stone mantle, inset gas fireplace and an open office area on the main floor. Upstairs is the huge master bedroom with walk-in closet and ensuite bathroom. Guest bathroom has a sleek walk-in shower and heated floors. Two large patios totalling more than 350 sqft; the lower South patio is your spot to chill in the sun and the west facing patio is your oasis to take in the sunsets. . SOME OF THE BEST VIEWS IN VANCOUVER! From the incredible renovation to the panoramic ocean, city and mountain views, this home is truly one of a kind and seriously stunning. Impressive kitchen with white cabinets, wood accents and giant wrap around breakfast bar. Very spacious main living space with built-in speakers, direct access to outdoor balcony, ideal for those that love to entertain. Dinner parties, wine nights, morning coffee, people watching, fireworks, this is the perfect place for it all. Every room is large, the windows are expansive, the master suite is totally impressive. Start and end the day with views from bed, enjoy his and her walk through closets, double sinks in the ensuite bathroom, massive glass shower and additional STEAM SHOWER. Car lovers-3 PARKING! OPEN SAT 2 - 4 . Welcome to 188 Keefer! This incredible two-level, two bedroom and three bathroom, corner unit Penthouse is situated in the heart of Chinatown in the tallest building in the neighbourhood! You will NEVER lose your views! This home is an entertainerâ€™s dream, with 550 square feet of patio space off of the main floor, with a built-in gas fire pit and custom planters for privacy. The second bedroom has been converted into a custom office, that still has room for a bed. Sweeping North-West views of the North Shore, Downtown, False Creek, and the surrounding area, with complete and utter privacy. The upgrade list is endless: re-done bathrooms & closets, fire pit and so much more! This home is a must see, call your REALTOR to book your showing today. . Truly one-of-a-kind PENTHOUSE at V6A in historic Chinatown. Over $200,000 spent renovating this 2 bedroom into a palatial 1 bedroom with built-in Murphy Bed, Basalt stone tile, Quartz waterfall island, roller shades, Bosch W/D, deep stone soaker tub & custom shower in the master, built-ins galore, Nest home system & more. AIR CONDITIONED, 8'9" ceilings, covered patio off the main plus a private 436 SF ROOF TOP PATIO with uninterupted views of the water, city & mountains. Lose yourself sipping wine in your Japanese hot tub with gas firetable by your side watching the stars. Neighbourhood is second to none filled with urban cafes, top notch eateries & cocktail haunts. 2 side by side parking, private storage, concierge plus a fabulous gym. 2 Pets & Rentals allowed. . Welcome home to this tastefully renovated pure luxury 2 Bed + den SW corner unit with bonus A/C installed by the seller! Enjoy breathtaking views of False Creek, Science World, mountains and sunsets from the floor to ceiling windows of your expansive living room. Cook up a feast in the gourmet kitchen with your Wolf range and duel oven. Don't forget to enjoy a hot coffee/tea on that nice sunny solarium, or sit out on the balcony to enjoy the best views in Vancouver. After a long day, step into your spa-liked bathroom, let the warm bubblebath or rainshower help you relax, then crawl into your king size bed in your great sized master bedroom. Progressive strata council- new elevators, new lobby and hallway upgrades. Close to everything! Skytrain, Ferries, seawall, Olympic Village! . Rarely available Waterfront facing and Penthouse 2 Bedroom + Den Space unit at the River District neighbourhood. Enjoy the view of Fraser River every morning to start your day. Modern interior finishes include Grohe faucets, stainless steel appliances, engineered-stone countertops and contemporary laminate flooring. Enjoy the recreational room and fitness centre in the building. 2 parking(tandem) underground, 1 locker, and balance of 2-5-10 new home warranty included. Walking distance to Save on Food, restaurants, Starbuck. And most of all the serenity of the river is in front of you. .
An absolute triple threat (Suite/building/Neighborhood) 1) Rare and spacious 3bed corner suite, includes Fisher Paykel appliances, gas range, European cabinets and quartz countertops. Refined interior is topped off w/ beautiful views + an abundance of natural light. 2) The Ellsworth, one of Mt Pleasant's most desirable and sophisticated, concrete buildings. This LEED Gold project has a 3500sq ft rooftop terrace with 2BBQs, outdoor kitchen, firepit, gardens and expansive views. 3) Located in heart of Mt. Pleasant w/ some of Vancouver's most unique restaurants and shopping. 2 PARKING side by side+storage, this unit truly offers all the comforts of a large home. Invest before Canada Line arrives. By private showing. .